Here is my most recent progress on Woodland Fairy…. Here is my most recent progress on Woodland Fairy. she is really looking lovely. I can’t wait to get up to her face soon. I think I am going to work on her for July’s Stitch-a-thon on FGBB. That would help me make some great progress on it. 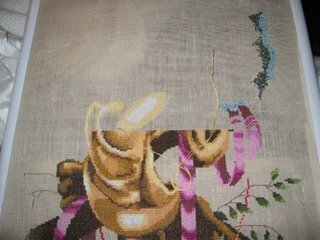 I also have a week off the first week of July during which I plan on doing TONS of stitching. This week, I also worked on White Wedding, but you still can’t really tell that I have made progress on page 3. Now I am off to work on Mystery 9 for the evening and then it is Celtic Winter for the rest of the weekend. YEAH!! Great progress on Woodland Fairy, Leslie!! You’ve made a lot of progress on WF! Those colours are sooooo similar to the ones I’m using now in Adia.